When the Hometalk Headquarter decor challenge was announced, I contacted Cori to find out a little bit more about their renovation and learned that the new space would be wide open. What better way to decorate a new space than with greenery? The list of benefits from office plants include increased creativity, improved productivity, reduced absenteeism, increased engagement with work, etc., so how could I NOT include a decor item incorporating a plant into my final project? Plants that are low maintenance make great office plants, and that includes plants that require relatively low amounts of water, so succulents are a great choice as long as they’re placed in a spot with lots of natural light! Today I’ll be showing you how to make a basket to ‘house’ a planter filled with succulents. This project was ‘inspired’ by the Hometalk logo, but this time I didn’t recreate it literally as I did with my previous projects. I upcycled a leftover piece of cut MDF from some centrepieces I created for a baseball-themed Bar Mitzvah. It struck me that the MDF ‘baseball diamond’ was house shaped, so I used the wooden base as a starting point for my basket. 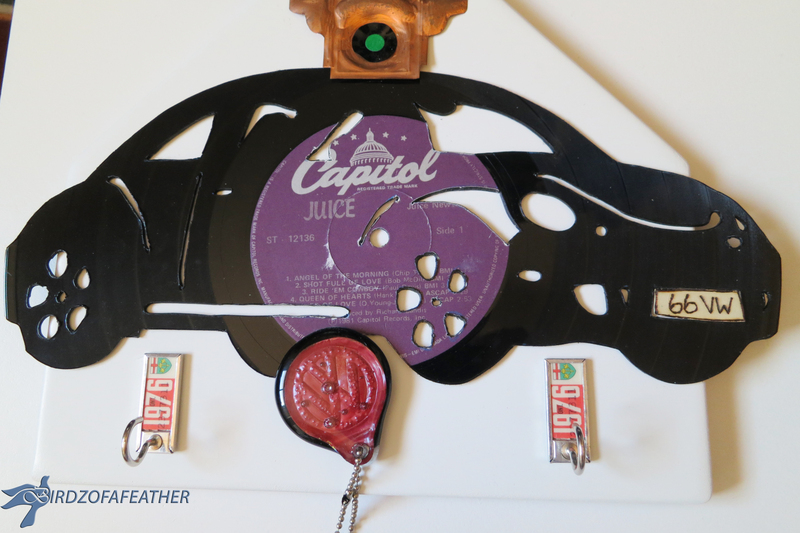 I used the same base as a backer for the vinyl record art I created for my VW Bug Keyholder. I love to upcycle so I NEVER throw anything away! Originally, we purchased the MDF from Home Depot. I painted the MDF base Hometalk’s signature blue and then marked 1/2″ increments around the perimeter. Hubs used a drill press to drill around the edge. I used a toothpick to clear out the holes and make sure that there was no debris left for the next step. To complete the rest of this project you’ll need: wooden craft dowels, twine, sisal rope, white glue, a glue gun, glue sticks and beads with a large enough hole to slip over the dowels. I also wanted to incorporate some of the signature blue into the woven element so I added in a strand of turquoise using some yarn I already owned. The mini dowels act as the ‘ribs’ of the basket. I added a dab of glue onto the bottom of each one and hammered them into the holes with a rubber mallet so they wouldn’t split. Let it dry over night, then you’re ready to begin weaving. I tied a knot and attached my twine/yarn combination to the dowel in the lower left corner and then started weaving in and out around the dowels. If you don’t want to make a basket, you could also turn this piece into a desk tray to hold various items and cut the dowels off at a lower height. Below you can see I was experimenting with placing a pen holder in the centre. Here’s a closeup of the twine/yarn combo. I think the blue coordinates beautifully with the base and adds a nice touch of colour to the finished product. Once you’re back to where you started at the corner, loop back around the last dowel so you can start weaving in the opposite direction. This will leave a gap at the corner, but don’t worry about it because it will get covered up from the inside with all the ends from the weaving. As you weave each row, push down on the twine to ensure the rows are level. Once the dowels were almost half woven , I added in two pieces of sisal rope to act as handles. Before I attached them to the basket, I took some thinner sisal and wound it around the cut edges so they wouldn’t unravel. Then I positioned them along the side and wove them into the starter row. Here’s a closer look at one of the handles from the inside of the basket. It’s not necessary to hot glue it to the sides because the weaving will hold it tight. On subsequent rows, you’ll need to position the handles either up or down in order to weave them in and secure them into the basket. You’ll get the feel for it as you go; I’d never woven before and once you get going, it becomes intuitive. Since you will be doubling back at the end of each row, take the opportunity to loop around both corner posts at least once to keep them together and strengthen the corner as shown below. I continued weaving until I used up all the twine and didn’t have enough to complete another row. Then I knotted the twine/yarn combo around the two corner posts where I originally started. Don’t cut the tail – you’ll need it later. To finish off the top edge I used a much thicker sisal rope. Because I wasn’t sure how much I would need to go around the entire perimeter, I unraveled the whole skein and folded it in the half in the middle. The picture below doesn’t show the corner dowel, it only demonstrates the fold of the rope, however I actually looped it onto the same dowel I initially started with in the lower left corner of the basket. Starting from left to right, bring one strand around the first dowel and criss-cross the other strand right over it in the opposite direction around the same dowel as shown in the picture below. Tighten as you go to keep it consistent, but don’t pull so tight that you skew the positioning of dowels (or worse yet, break one)! This rope feature will give you a braided look along the edge. When the edging is complete, bring both pieces of the rope to the inside of the corner as shown five pictures below and follow the instructions under ‘finishing off the edging’ to secure it to the inside of the basket. To finish off the top of each dowel, dab a bit of white glue onto a bead and insert it onto the top of the dowel. You can also use hot glue if you’re careful not to drip it everywhere! I bought a variety of different coloured beads from the dollar store; if you want to switch up your decor you could even forgo the glue and switch out the beads whenever the mood strikes. The weaving around the top is tight so it’s not going to go anywhere; the beads are just to give it a finished look. As you can see below, not every dowel is exactly the same length, so just take a mini hacksaw and trim off any that are too long and protruding past the bead. I stopped weaving the handles in before I got to the top of the basket because I thought it might look good if they just flopped to the sides, but when I was done I changed my mind. I used the bodkin shown below and some of the turquoise yarn to secure the handles to the sides of the basket so they would stand up better. Once you’re done with the decorative stitching, place a dab of hot glue over the knots of the yarn on the inside of the basket to hold it securely and keep it from loosening over time. At the corner, bring the double strands of rope to the inside of the basket. Remember that tail of twine/yarn you saved from the main weaving? Use it to wrap around the two pieces of the rope to secure it all together. When you get to the end, secure the twine with a dab of hot glue underneath the rope where it can’t be seen. I used a clip to help secure the twine while I was determining the length to cut it and reaching for the glue gun. It acts as a second pair of hands. Eyeball the length of the interior corner from the top of the basket to the base and apply a dab of hot glue to join the two pieces of rope near the bottom. Also apply hot glue just above where you will be cutting the rope to keep it from fraying (glue along the inside where it won’t be seen). Cut the rope even with the bottom of the basket and then secure it to the corner base with a dab of hot glue (again where it won’t be seen). I didn’t glue along the seam itself: I only glued the rope at the bottom as I didn’t want glue oozing out through the weave of the basket! Here’s how the rope looks from the inside of the basket secured to the inside corner. If you wish, you can take a pair of scissors and trim away some of the longer ‘flyaway’ strands of the sisal to tidy it up. I didn’t add the ‘Inspire‘ wording to the basket as shown below, but if I was using this as a desk tray I might add it in to coordinate with the earlier pieces I created for the Hometalk HQ decor challenge. Of course, the handles wouldn’t be necessary to add if you were making this as a tray. Here’s a look at the final basket on its own. I used a planter filled with succulents that I already owed to demonstrate how pretty it would be planted up. If I had more time I would definitely make a custom hypertufa planter to mimic the shape of the inside of Hometalk’s logo – and fabricate it in white concrete! It just so happens that I have a DIY tutorial on how to construct a hypertufa planter that you can use to accessorize this basket if you want to take it that one step further. The possibilities are endless for this project: you could make this basket in any shape your heart desires. I already have special plans to make a thank-you gift, and for my own craft studio I’m going to weave a basket using my Birdz of a Feather logo so I can use it for thread storage. I’ll update you on both projects once they’re done. Well, that concludes my ‘Inspire’ series for Hometalk’s HQ. It’s time for me and Hubs to turn our attention to putting the finishing touches on my craft studio. I’m looking forward to reclaiming our dining room table again and to bringing you even more projects once my new craft space is up and running! If you enjoyed this project, please pin and post on Facebook. To see the other projects in the ‘Inspire‘ series created just for Hometalk, click the links below. Get your craft mojo on at Birdz of a Feather and subscribe! Follow us right here (link in the footer) or on Bloglovin’ (button below)! You can also follow us on Pinterest, Facebook, YouTube and Instagram. This entry was posted in Craft Rehab, DIY, Office Decor, repurposing and upcycling by Sara. Bookmark the permalink. Sara, you are so clever! I can’t believe you made a basket. The sisal and blue yarn look great together. You’ve really been having fun with these Hometalk projects. You get my vote!